(NaturalNews) The United States government claims 100% ownership over all your DNA and reproductive rights. 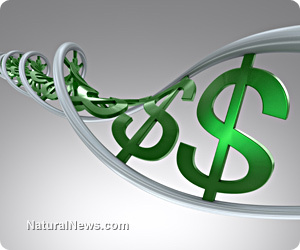 This astonishing revelation has emerged from the fact that the U.S. Patent and Trademark Office claims the power to assign ownership of your DNA to private companies and universities who apply for patents on your genes. To date, more than 4,000 genes have been assigned ownership to corporations and universities by the U.S. patent office. Such an assignment of ownership proves that the government believes it owns 100% of all human genes -- you cannot transfer ownership of something unless you first own it yourself. To date, 20 percent of your genetic code is owned by someone else. About two-thirds of these patents belong to private companies, and one-third belong to universities. The company that owns the most patents is called Incyte, a drug company based in California which "owns" the patents on 2,000 human genes. Although you have never agreed to sell your body to a corporation, a multitude of corporations now claim ownership over every cell in your body. That ownership makes you a slave to their patent demands, and patent "troll" lawyers are some of the most vicious, blood-sucking demons on the planet who will threaten to drag you into a million-dollar court proceeding if you don't pay them money. Right now, at this very minute, dozens of corporations can lay claim to your body, and those claims will be 100% upheld in the U.S. court system. Virtually no one is aware of the fact that 20 percent of their genes are currently "owned" by corporations and universities. This ownership is, of course, a form of genetic enslavement that seeks to dominate and control all humans. How, exactly? Consider this: When you have a child, you are replicating your genetic code. Because your genetic code is 20% patented and "owned" by someone else, the act of having a child is, by definition, an act of genetic piracy that you are committing in violation of the law. These companies that "own" your genetic code can, if they wish, demand you pay royalties for every child you create. They can even demand that you pay them royalties for your own body replicating cells during processes like healing skin wounds or generating new red blood cells. Your body, in fact, replicates millions of cells each day, causing you to violate the U.S. government's laws on the theft of intellectual property. You are the criminal! This all comes down to a fundamental human rights issue. This is about human rights, women's rights and reproductive rights. The U.S. Patent office stands in violation of human rights, selling out the bodies of men and women to corporate interests that stand to generate trillions of dollars in profits through DNA testing and treatments. People like Angelina Jolie actually betray women on this issue by pushing false fear that drives profits into the BRCA1 gene testing industry -- an industry that exploits women's bodies for profit. Jolie is using her celebrity status to spread huge fear about the BRCA1 gene mutation, causing women to rush into their doctor's offices to get tested... at $3,000 - $4,000 per test thanks to the royalty fees paid to the corporate patent holder. The U.S. Supreme Court is poised to announce a decision on the issue of gene patenting in just a few weeks (which explains the timing of the recent media push we've all witnessed). If the Supreme Court rules against these patents on human genes, it would mean a multi-trillion-dollar loss to the human gene patenting industry which hopes to collect ongoing royalties on gene testing and gene research for the next thousand years. By the way, the very idea that the Supreme Court can "rule" on this issue is also a fraud. No court has ownership over your genetic code. No government authority has a higher power than the Creator of the universe and the creative, life-giving forces that brought you into being. Your DNA is yours alone, and any claim over it is null and void from the start. If the Supreme Court upholds the absurd notion that human genes can be patented by corporations, then there's no end to where this all goes: corporations could file patents for grass, fruits, birds, ants, insects and even other human body parts such as ears, hands and feet. Your eye color could be patented because that's controlled by genes, too. Once all these things that already exist in nature are patented, you can be hauled into court and forced to pay exhorbitant fines and fees for having them on your property. Got some ants invading your yard? That's piracy, you criminal, because those ants are patented! If this sounds absurd, note carefully that Monsanto has successfully sued farmers using the exact same logic. Their patented GMO seeds were blown by the wind into farmers' fields, so Monsanto sued those farmers in court -- and won! The farmers' crimes? "Stealing" Monsanto's intellectual property. Make no mistake that the entire point of seeking patents over things like human genes, animals and plants is so that the patents can be used as weapons of control against the masses. The patenting of human genes is, at every level, a crime against humanity. And all those who support this industry -- like Angelina Jolie -- are supporting criminals who exploit the bodies of men and women for profit. 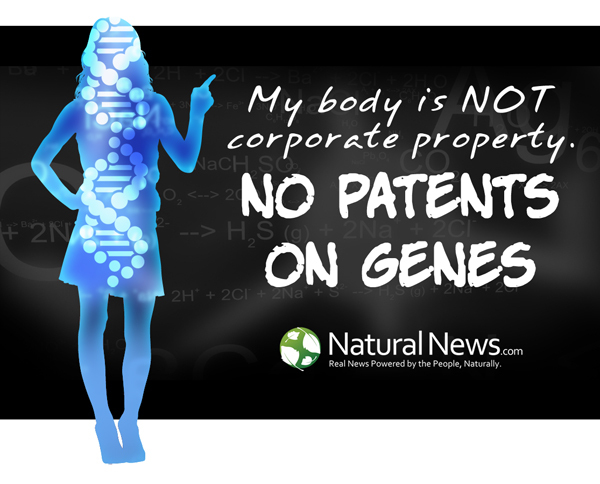 Say NO to patents on human genes! Say NO to patents on animals! Say NO to Monsanto and NO to the insanity of government-enforced intellectual property laws that violate universal justice.